The course focuses on the following elements. Pre boarding. Safe boarding. In flight safety. Safe disembarkation. In flight emergency actions. Use of Emergency Breathing System equipment. Practical Emergency escape Breathing System training. Practical emergency ditching and escape training. 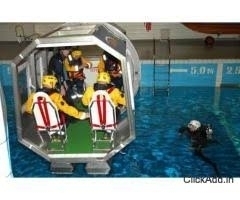 Abandonment theory and practical sea survival training. Actions for mustering and boarding of a survival craft, and actions as a passenger during launching operations. Use of helicopter rescue strops, and winching procedures. Emergency First Aid including CPR. Nature and causes of fire. Fixed systems and response. Use of hand held extinguishers. Operation of fixed hose reels. Self rescue techniques in reduced visibility and completely obscured visibility. Use of escape hoods.